Originally posted at Huffington Post. View the original post here. WASHINGTON — The growth of wind power in the United States is putting a significant dent in emissions, according to a forthcoming report from the American Wind Energy Association. 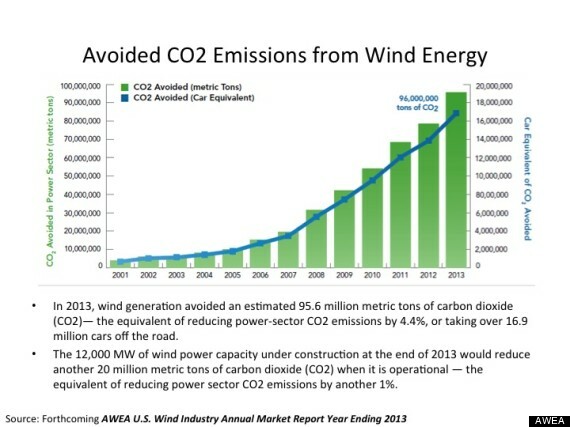 Wind generation avoided 95.6 million metric tons of carbon dioxide in 2013, which is equivalent to taking 16.9 million cars off the road. That’s a 4.4 percent cut to power sector emissions, when compared to the level of emissions that would have been generated if that power had come from fossil fuels. Wind proponents say that’s evidence that the wind industry is playing a major role in meeting U.S. emissions goals. “Every time a megawatt of wind power is generated, something else is not generated,” said Elizabeth Salerno, AWEA’s vice president for industry data and analysis. There are now 61,000 megawatts of wind power installed in the U.S., with turbines in 39 states. Another 12,000 megawatts of wind power are currently under construction, and power projects for which contracts are signed but construction has yet to start are expected to produce another 5,200 megawatts. AWEA says those additional projects should cut another 1 percent of power sector emissions, putting the country closer to the Obama administration’s goal of cutting total U.S. emissions 17 percent by 2020. 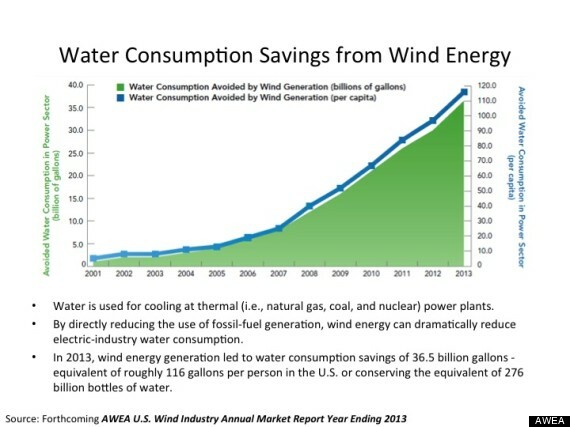 The AWEA report also found that the expansion of wind energy has helped reduce water consumption by 36.5 billion gallons, or about 116 gallons of water per U.S. resident. Thermal power plants, which include coal, nuclear and some natural gas-fired units, use the fuel source to boil water, which produces the steam that turns the turbines that generate electricity. Plants also require water for cooling, whereas wind turbines do not. Jordan Macknick, an energy and environmental analyst at the National Renewable Energy Laboratory, has said that wind is the “clear winner” when comparing the water use of different types of electricity generation. AWEA says two big factors could help boost the continued growth of wind: the extension of the production tax credit, which provides a financial incentive for wind development, and possible changes to the EPA’s emission standards for existing power facilities. Regarding the former, the Senate Finance Committee approved a billThursday that would extend the credit through the end of 2015. It had lapsed at the end of the 2013. As for the EPA, it’s still not clear what the standards for emissions reductions fromexisting power plants will look like. The EPA said Friday that it has sent its draft standards to the Office of Management and Budget for interagency review, and expects to release those draft standards in June, per President Barack Obama’s climate action plan. EPA Administrator Gina McCarthy has said that standards will be crafted in a way that allows states to develop their own feasible emission reduction plans through energy efficiency measures and the increased use of renewable energy. It’s not yet clear, however, how steep the emissions cuts for existing plants will be. It’s also not yet clear how much of a state’s compliance with the standards will be expected to come from changes inside the power plants — such as efficiency or technology upgrades — or from added capacity via renewables. AWEA argues EPA could “set the standard pretty aggressively” for states to use additional generation from wind and other renewables to comply. Next Next post: Yes 2 Renewables launch RET Road Trip!